Form: Extremely polymorphic and fast-growing, changing shape in a few weeks. Encrusting as thin sheets or cushions, Massive lobose; with or without 'tassels', or branched. It can also occur in hollow 'amphora' shaped forms in sheltered conditions. Colour: An intense reddish orange. The pigment squeezes out easily between thumb and forefinger. It goes colourless in alcohol. The sponge may be colourless in deeper water. Smell: A characteristic and unpleasant strong smell - not dissimilar to that of Halichondria panicea. Not present in 'amphora' form? Consistency: Soft and easily torn, very compressible. Surface: Even. Minutely hispid. Moderate friction. Fairly open in appearance. The sub ectosomal tissue is peppered with inhalent pore channels which are covered with a thin, transparent layer. This is apparent in the field. Apertures: The oscules may be only slightly raised from the surface or be characteristically at the top of volcano-like growths and may have 'tassel' growths originating near the margin of the oscules. The oscules do not contract. They are inconspicuous in encrusting forms, and large or crateriform in massive forms; they are often arranged in linear series in the branching forms. Skeleton: Plumoreticulate. The main skeleton is an isodictyal to sub-isodictyal reticulation of multispicular fibres, reinforced with variable amounts of spongin (depending on the age of the sponge). There are no echinating spicules, nor any special ectosomal skeleton. Spicules: The megascleres are smooth, usually curved, styles (a) 170-(225)-500µm and 150-(170)-200µm. The micro-scleres are small palmate isochelae (b) (20µm), which may be rare in some specimens. These chelae are typical of the Microcionidae (Clathriidae) and may indicate that this species should be placed in that family (BEP). Habitat: A wide range, from sheltered sites to extremely exposed ones. It may be found in strong tidal rapids, e.g. 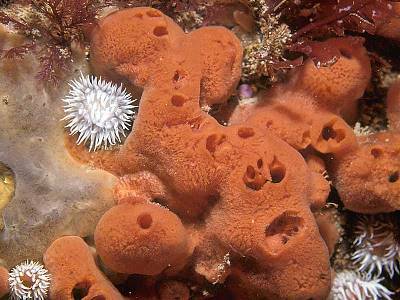 Menai Straits and Strangford narrows; on rock and under stones; amongst hydroids (it will grow up Tubularia stems); and has even been found on ascidian tests. 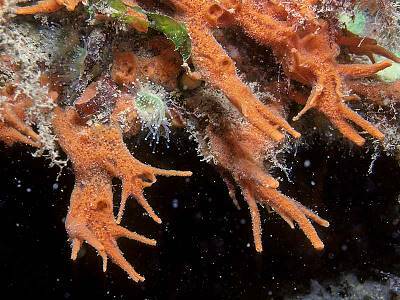 It is often found growing on/in Laminaria holdfasts on the lower shore and shallow sublittoral. The 'amphora' form grows on shells in sheltered places. An infralittoral species, seldom found in the circalittoral zone. Distribution: A common and widespread species in the British Isles. Voucher specimens from: Faeroe, Strangford Lough; Menai Straits; W. Anglesey; Skomer; Lundy; Cornwall; W. Sussex; Tiree. "Atlantic coasts of Europe, from Norway to France." 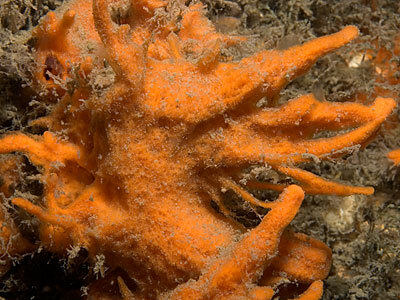 Identity: The shape of this sponge is very variable and is in many ways almost as polymorphic as Halichondria panicea; like Halichondria panicea it also occurs in a wide variety of situations. 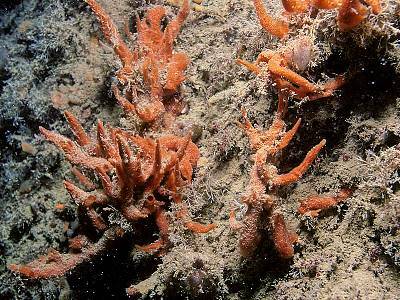 It is a very common species in the shallow sublittoral, especially in areas of increased water movement, e.g. tidal narrows. The smell, nature of the tassel form, the oscules, colour and surface texture in combination are useful in helping recognition of this sponge, whilst alive or freshly collected. S.M.S. : 'A problematic species undergoing taxonomic review. Treat all identifications as provisional at present. There are a large number of Bowerbank synonyms to be checked which may result in a 'splitting' of the entity A. fucorum as now understood. Corybas lobata (q.v), is probably closely related to A. fucorum; the spiculation of the two species is almost identical.' However, Corybas has a more regular skeleton of ascending bundles of styles with single connecting styles. The chelae of Corybas are anisochelae (but with only slightly disparate ends). Corybas is cream coloured when alive. 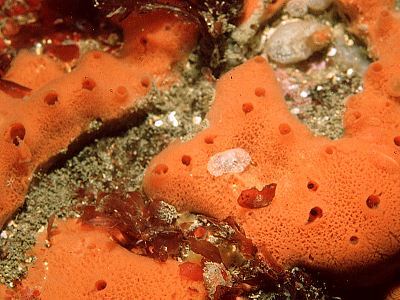 In situ, Amphilectus is one of at least 5 species of common red or reddish-brown encrusting sponges, but the soft texture and open surface of Amphilectus are quite distinctive. Voucher: BELUM : Mc175. Strangford Lough, Down. Editors: R.Earll, D. Moss, B.E. Picton.